I have been discussing libraries as places and in the current struggle to preserve public libraries not enough stress has been laid on the library as a place not just a facility. To a child living in high flats, say, where space is at a premium and peace and quiet not always easy to find, a library is a haven. But, saying that, a library needs to be handy and local; it shouldn’t require an expedition. Municipal authorities of all parties point to splendid new and scheduled central libraries as if this discharges them of their obligations. It doesn’t. For a child a library needs to be round the corner. And if we lose local libraries it is children who will suffer. Of the libraries I have mentioned the most important for me was that first one, the dark and unprepossessing Armley Junior Library. I had just learned to read. I needed books. Add computers to that requirement maybe but a child from a poor family is today in exactly the same boat. 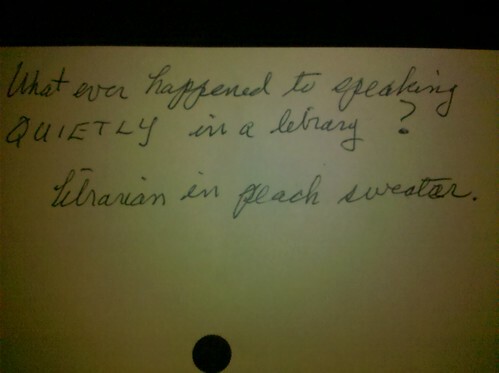 Here’s looking at YOU, librarian in the peach sweater! He makes a mighty fine point. Well we all thought here in Australia, that libraries would not be facing the cuts seen by our colleagues in the US and Europe. But in Victoria (the birthplace of Australian public libraries) the state government has indicated cuts to council funding for libraries. A campaign has begun, the media are supportive and councils are opposing, and there is of course a facebook page to bring it all together. Users of Pirate Bay searching for the latest episode of True Blood (yeah I know you use Isohunt, I was just being funny), may be confused by the number of philosophical items suddenly available. The war with publishers that libraries and academics have been fighting for many years over the price of scholarly journals, may be entering into a decisive phase. If enough scholarly material becomes freely available for researchers, academics and the public then the charging of thousands of dollars a year for individual journal access to libraries will become a thing of the past. Which will be a great boon for the dissemination of knowledge throughout and especially the developing world. The next step is ensuring that peer review continues outside of these journals. Already journal reviewers and editors do not get paid for their services, and neither do authors (publishers take all) so it just requires organisation, something which universities should not find too hard given the will. Is this the rise of the online circulating or subscription library? Amazon/kindle is now offering to rent textbooks. If this takes off, how long before other book types will be offered? Circulating and subscription libraries existed for very many years in Australia and elsewhere offering rental of popular (mainly fiction) works, until they were replaced by free public libraries. Given the right price there is no reason why this business model could not come back. At the moment due to licensing restrictions imposed by some vendors public libraries that lend ebooks, are generally unable to lend an individual ebook out to more than one borrower at a time. 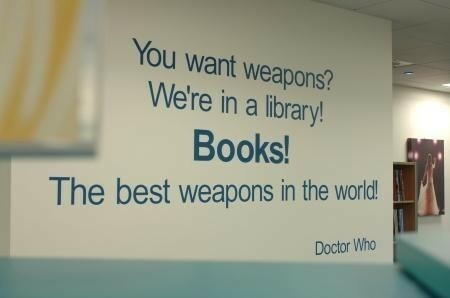 Therefore just as with paper books a reader generally cannot get immediate access to very popular works from a library. If they can get that immediate access for a reasonable fee from an ebook retailer, it would be a very attractive proposition for many readers. See this interesting article on circulation libraries in Melbourne 1930s-1960s, it does tend to show that commercial competition could be successful even where there were public libraries. Will public libraries renegotiate or object to the licensing conditions they are currently offered, and demand multiple simultaneous use for all their ebooks, or will they let commercial vendors determine their future. And if ebook publishers or retailers, in the future, get to lend more books than the libraries, will they then negotiate with government to take over library provision themselves. The digital revolution remains disruptive.